Railpictures.ca - Steve Young Photo: An empty coal train departs Edmonton for the coal fields around Hinton, Alberta. Also in the yard is a loaded sulphur train with a caboose on the west end. That likely means that it arrived from the Kaybob via the Sangudo Sub. Union Junction, just beyond the head end of that string of cars, is where the Sangudo Sub joins the Edson Sub mainline. Due to the configuration of that junction, the train entered the Edson Sub and had to back into Bissell yard. There is a soon-to-be eastbound grain train and a string of ballast cars in the yard, too. | Railpictures.ca – Canadian Railway Photography – photographie ferroviaire Canadienne. Caption: An empty coal train departs Edmonton for the coal fields around Hinton, Alberta. Also in the yard is a loaded sulphur train with a caboose on the west end. That likely means that it arrived from the Kaybob via the Sangudo Sub. Union Junction, just beyond the head end of that string of cars, is where the Sangudo Sub joins the Edson Sub mainline. Due to the configuration of that junction, the train entered the Edson Sub and had to back into Bissell yard. There is a soon-to-be eastbound grain train and a string of ballast cars in the yard, too. Thanks for the answers. The only coal train I worked in Edson in that short period was Coal Valley to Thunder Bay. Apparently, Alberta has both coking and thermal coal coming shipping out of the Hinton area. Thermal coal comes out of Obed and Coal Valley. Tech mines coking coal (Anthracite) – perhaps that is what is at Grande Cache and Cheviot mine near Cadomin. Hamilton was the only other site that I found with piles of coal at dockside on the greatlakes’ Canada side (Thunder Bay and Naticoke, where the others). Ontario has very few coal-burning generating stations – one in Thunder Bay, and Nanticoke. I found an oil-burning plant on Lake Ontario (Lennox Generating Station). I guess these are rather large facilities since I would see coal trains in Edmonton quite regularly. That seems like a long way to ship coal. No, I think that guess is spot on. Coal Valley would have needed dynamics(a few steep grades coming back down to Bickerdike). There were a couple of Thunder Bay trains; still are I believe. As long as we need steel, they should keep running. I have a Trackside guide from 1997, which may not accurately represent what was going on in 1988, but here it goes…. 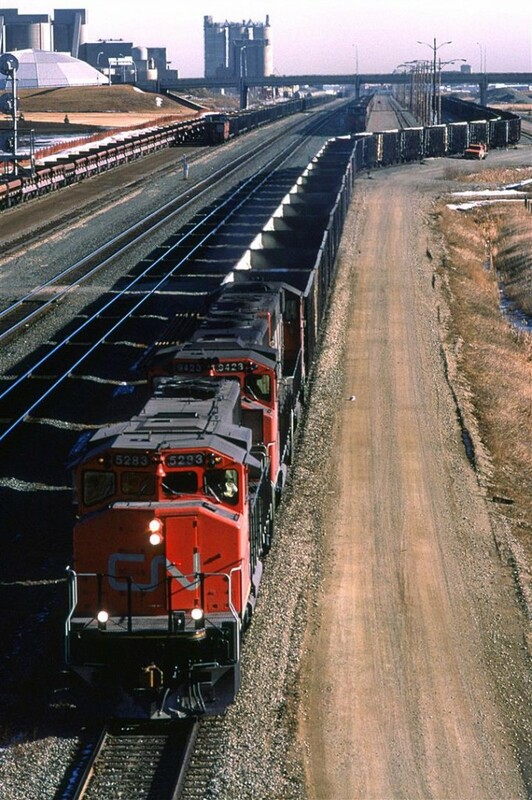 Cn had two coal trains that delivered to a trans-shipping facility in Thunder Bay (from another source, this coal went to Ontario Hydro generating stations). Coal originated from Winniandy (Grande Cache) and Coal Valley. The TG also list a train that went to SK, but it would not come through Edmonton. So, it looks like these locomotives were not likely to take this train much beyond Edson or Jasper. The coal train will likely keep this power for the return trip to Edmonton, and perhaps points beyond. The Sulphur train arrived some time before I was on the scene. Its power went to the shops and a new set will come to take that train west.